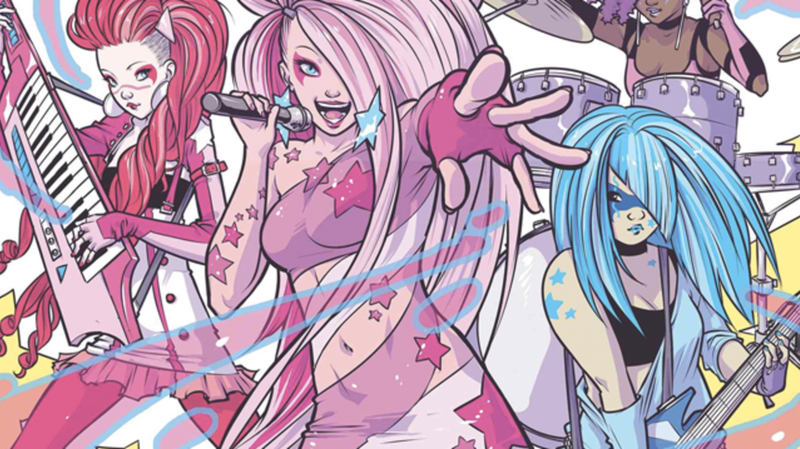 Jem and the Holograms is just about as '80s as cartoons get, and naturally it had to find its way into comic book form (this week also sees Miami Vice Remix from IDW in conjunction with Lion Forge Comics, who are planning on putting out Knight Rider and Air Wolf comics next). Known for its big hair, keytars, and excessive use of hot pink, Jem may not seem like an easy property to set in modern times, but Kelly Thompson and Sophie Campbell decided to do just that. But with throwback ‘80s music and fashion such a big thing these days, that shouldn't be that hard. One way they plan to update the comic is to build on Jem’s already good track record with diversity. In addition to making rival band The Misfits more racially diverse, Thompson and Campbell will be making at least two characters in the series—Kimber and Stormer—gay. Additionally, Campbell has redesigned the characters to give them all more realistic body-types rather than the Barbie doll figures the original characters were designed with. Sophie Campbell, a transgender woman who is in the transitioning process, recently changed her name professionally after been previously known as Ross Campbell (known for the graphic novel series Wet Moon and Image’s recent revamp of its Glory series). Campbell’s work has been applauded over the years in small indie comic circles, but this book will be her introduction to a brand new and much wider audience. Here's some preview imagery. In the 1940s and early 1950s, romance comics accounted for a large sector of the comic book market but, as with other once-popular genres like horror, crime, and science fiction, the implementation of the Comics Code in 1954 resulted in a stultifying self-censorship that made the stories bland and uninteresting. When superheroes had their “Silver Age” renaissance in the 1960s, every other genre got pushed aside until the 21st century rolled around. With crime, horror, and science fiction comics now as healthy as they were back in their heydays, could it be time for romance comics to make the same comeback? Janelle Asselin, a former comics editor for companies like DC and current Senior Editor at ComicsAlliance.com, is a respected defender of female comics creators and female representation within comics. Her columns like “Hire This Woman” highlight up-and-coming female cartoonists and also skewer publishers for covers and content that sexualize female characters that are ostensibly meant to be read by readers of all ages. Asselin is looking to revive the romance comic with Fresh Romance, a monthly digital magazine featuring serialized comics, relationship advice columns, behind-the-scenes artwork, and even a fashion report. Each issue will contain three stories that attempt to truly focus on romance between two people (both gay and straight). Though there will be some adult content, it will not simply be erotica, nor will it be light, saccharine fluff. Included are stories about two high school girls who try to keep their love secret by pretending to compete for the same guy (written by Kate Leth with art by Arielle Jovellanos and Amanda Scurti); a regency-era romance about a couple that is about to be married despite a lack of enthusiasm to do so (written by Sarah Vaughn with period-perfect art by Sarah Winifred Searle); and a science-fiction story about a barista whose only way to escape the world she’s trapped on is to help enough lonely souls find love (written by novelist Sarah Kuh with art by newcomer Sally Jane Thompson). Asselin is using Kickstarter to fund the first three issues as an experiment to see if the market can support this type of a comic. She will probably have easily reached her goal by the time this article is published. Throw in your support here. For readers of Grant Morrison’s excellent The Multiversity series, this penultimate issue is probably the one they’re most anxious to see—potentially moreso than the final chapter (The Multiversity #2 coming in April). This issue is expected to tie together the various strings we’ve seen in the mostly stand-alone stories so far. It’s the so-called “haunted comic” that has been driving the plot behind this series, which is about chaos and disruption ripping through DC’s “multiverse." What purportedly makes this comic “haunted” is that it takes place on Earth-Prime which, in DC multiverse folklore, is the earth that we live on. 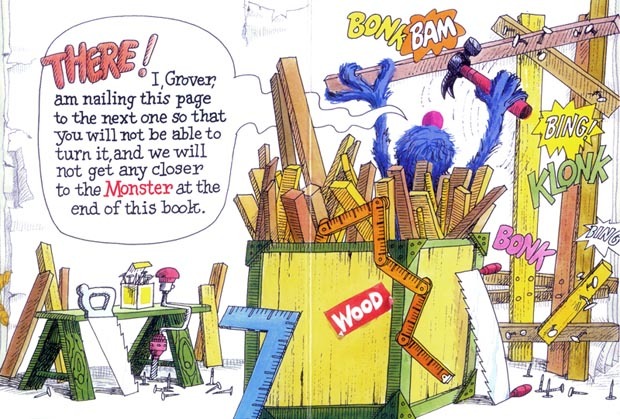 We, the readers, will play an active part in the story, even being encouraged to stop reading in order to prevent the fatal events of the story from playing out (a trick Morrison seems to have cribbed from Sesame Street’s Grover). This kind of fourth-wall-breaking is classic Morrison, who is very much a believer in “living stories” and the active participation of the reader’s imagination. Another fact to get readers and especially Morrison fans excited is that this issue sees the reunion of Morrison and Doug Mahnke, his collaborator from Final Crisis: Superman Beyond, one of the weirdest, most mind-bending comics DC has ever published. Get a glimpse of the role you’ll be playing in this story, if you choose to play it. At some point, the idea of having super powers aged from pre-adolescents wanting anything they can imagine to teenagers wanting to escape. It probably began in the 1970s with the rise in popularity of Marvel’s beleaguered mutants in the X-men, but the teen angst subtext got pushed even further into the foreground by Brian Wood and Becky Cloonan in their 2003 series Demo, which told realistic stories about angst-ridden teens with superpowers relegating the super powers to the background and eventually away altogether. The team behind We Can Never Go Home seem to be aiming to explore the same peripheral space in superhero comics that Demo was going for a decade ago but with a louder, more abrupt, punk rock take on the concept. We Can Never Go Home begins with two teenagers—one an awkward misfit, the other a popular girl—each with horrifying superpowers that they can barely control. They don’t seem like they’re going to be donning costumes or even doing anything that might be considered “good” or “responsible” with their powers, and it’s probably unlikely a kindly benefactor will be coming along to teach them how to control them. This five-issue series comes courtesy of Black Mask Studios, a new publishing and media company started by the artist Steve Niles along with film director Matt Pizzolo and musician Brett Gurewitz that aims to give new opportunities to creator-owned comics. The creators behind this one are all up-and-comers but the artist, Josh Hood, whose style is reminiscent of Steve Dillon and Jamie McKelvie, is sure to be a breakout star here. Black Mask has put together a pretty excellent trailer for the comic here. Monica Gallagher is another up-and-coming cartoonist who has a number of mini-comics and anthology appearances under her belt. She has done some interesting short auto-biographical works that are based around ideas of femininity (Boobage and When I Was a Mall Model) that we don’t often see addressed with this much comfort and sincerity in comics. Part-Time Princesses is Gallagher's first graphic novel from a major publisher, and it has a clever, promising concept that seems to fit nicely into Gallagher’s wheelhouse. Four teenage girls whose summer job is to play fairy tale princesses in a low-rent knockoff Disneyland amusement park find their dreams of college, modeling, and acting temporarily derailed and must come crawling back to the job they all hate. But when that job is about to be taken away from them and the park is about to be closed due to fear of local gangs, they decide to fight to save it. The story has the feel of a Hollywood teen summer comedy, complete with training montages, forbidden romance, and student archetypes being forced to come together. Unfortunately, it ends up trading most of its teen comedy tropes for comic book tropes as the girls end up primarily solving their problems by fighting off gangs rather than using their individual talents to make the park a more inviting place. Oni has serialized this book digitally on Comixology with a collected print edition hitting comic shops this week. This is an early work from a rising talent though, and she will be someone to watch in the near future.